Does your dream destination wedding include Hawaii? Friends recently asked me to recommend Hawaiian tours, resorts, destinations and wedding event planners for their upcoming Hawaiian wedding. We frequently visit the islands and have ideas we can suggest. For our trips, we design our own itinerary then reservations accordingly. Since we are not familiar with wedding planning, Hawaiian tour planning, resorts and destination weddings, we offered to ask for recommendations. The couple has a flexible schedule and is looking to tie the knot this fall or winter. The wedding could be in Hawaii or Hawaii may be their honeymoon destination. They would like to have an outdoor wedding. The couple is Catholic though a non-denominational ceremony is acceptable. The group would like to visit one or two islands during their stay. Several friends and family members will accompany them on their trip. Four star hotels would be appropriate. During their stay, they are interested in activities though like to enjoy relaxing down time too. ATV rides or helicopters sound like fun. An all day hike into Haleakala is more active than they like. Pools and beaches are not a big draw. They would like someone to arrange the wedding: license, photographer, official, meal, etc. If you were married in Hawaii: What locations do you recommend? Any words of wisdom to share? I have a photographer lined up for their wedding for Shine Pics, but I’m a little lost on the rest of their requests. If you are a Hawaii business: What services can you offer or recommend? Resorts, hotels, photographers with large portfolios of stock photos, activities, etc? The Hawaii Five-0 television series ran from 1968 to 1980. Filmed in Hawaii, the show featured the fictional Hawaii State Police whose offices were in the Iolani Palace in Honolulu. The show drew an increase in tourists to Hawaii despite the violent crime in each show. We have been watching the shows newly released on DVD. From the pilot show through season 7 we watched the cast and landscape of Hawaii change. Waikiki, Diamond Head and Honolulu look very different now though the Kahala Inn looks much the same. The most fun is to see the places we visit when we are on island. Over the years a series revival has been discussed. So far, no solid announcements have been made. What stories do you have about the Hawaii Five-0 show, cast, crew or location? Log in a share your tales. Book ’em, Danno! So You Think You Know Hawaiian History? We travel to Hawaii often and likely know more about Hawaiian history than the casual tourist to the islands. Our visits include stops at cultural and history sights important to making Hawaii the diverse location that it is. Then we met Richard Wong, tour guide for Ohana Tours. When our friends at Ohana Tours heard about our love of history and Honolulu they invited us to check out the weekend walking tour of the downtown area. We took our ohana (family) to meet Richard on a recent Sunday morning. Our adventure began in downtown Honolulu in front of the golden Kamehameha Statue in the heart of the city. You can see this statue on the Hawaii state quarters released as part of the state series. For the next two hours Richard shared history of Hawaiian culture, religion, politics and people. As history buffs ourselves, we were overwhelmed by the detailed stories our guide shared with us. Richard is a gifted story teller. His vivid words and smooth delivery made the tales come alive for us. Drawing on a long career as a Honolulu police officer, he personalized his tales with accounts from his time on the force. We found another link between us and our guide. To bring the islands to us when we are in the Midwest, we started watching the Hawaii 5-0 television series starting at the pilot. I get chills every time I hear the Hawaii Five-0 theme song playing. The show ran for 12 years from 1968 to 1080 and was filmed in Hawaii. The second floor of the Iolani Palace was the fictional state police headquarters. Many scenes were filmed at the iconic Ilikai Hotel in Waikiki overlooking Duke Kahanamoku’s Lagoon and the Honolulu Marina. Richard worked security during many of these shoots and shared stories of the cast and crew. He even had a few on screen parts. You can read more about our tour on the www.808talk.com article. Listen to how Richard started out our tour below. If you are staying in Honolulu over a weekend, check out Ohana Tours for information or reservations. 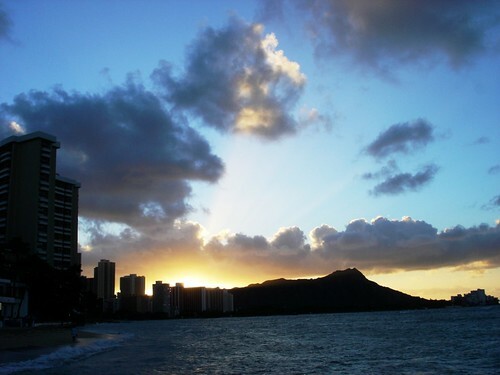 Looking for a great way to spend an afternoon in Honolulu? 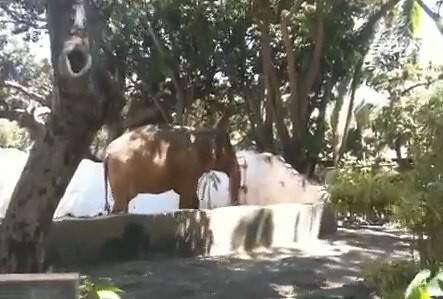 Stop by the Honolulu Zoo just a block away from world famous Waikiki Beach. This jewel in the Waikiki neighborhood is just the right size for a few hours of leisurely strolling. When you walk into the park, the first exhibit you’ll see is the scarlet flamingos. Did you know they are pink because of the seafood they eat? This is one of the few places you’ll be sure to see the native Nene birds. Other favorite exhibits I make sure not to miss include the Galapagos tortoise, monkeys, orangutan and African elephants.